Sciatica can be a real pain in the back, among other things. Also known as lumbar radiculopathy, sciatica (pronounced sci-at-ick-aa) is a term used to described a series of symptoms—most notably, pain—that occurs when the sciatic nerve is irritated. This large nerve runs from your lower back, past the buttocks and down each leg. Sciatica is currently estimated to be the cause of low back pain in five to 10 percent of Americans. What are some stretches to alleviate sciatica symptoms? The beauty of creating a routine to manage your sciatic pain is that it also serves as a way to prevent sciatic pain and other symptoms from making a reappearance. In fact, though it may seem unlikely (or unpleasant), exercising actually helps to improve symptoms better than bed rest. While lying on your back, bring your right leg up to a right angle. Grip both hands behind the thigh and lock your fingers. Lift your left leg and place your right ankle on top of the left knee. Hold the position for a moment, then repeat with the other leg. Bend your right leg, putting your right ankle on top of the left knee. Lean forward and allow your upper body to reach toward your thigh. Lie on your back with your legs extended, and your feet stretched upward. Bend your right leg and fasten your hands around the knee. Lightly pull your right leg across your body toward your left shoulder. Hold it there for 30 seconds. Push your knee so your leg returns to its starting position. Repeat for a total of three reps, and then switch legs. Sit on the ground with your legs stretched straight out with your feet arched upward. Bend your right knee and place your foot flat on the floor on the outside of your opposite knee. Place your left elbow on the outside of your right knee to help you gradually turn your body toward the right. Hold for 30 seconds and repeat three times, then switch sides. Place your right foot on a raised surface at or below your hip level. Flex your foot so your toes and leg are straight. Bend your body forward slightly toward your foot (without feeling pain). Release the hip of your raised leg downward as opposed to lifting it up. If you need help easing your hip down, loop a yoga strap or long exercise band over your right thigh and under your left foot. Hold for at least 30 seconds, and then repeat on the other side. Ah, winter. The thrill of sledding, the joy of skating … and the dread of shoveling. 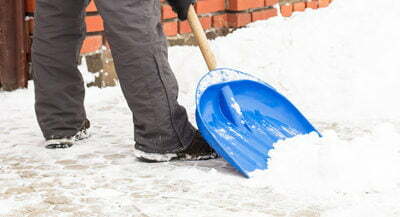 Snow shoveling is one of the most common causes of back injuries during the winter season. That said, it is possible to stay pain-free while making your property pedestrian friendly. It may seem a little odd since warming up is typically associated with sports and exercise, but shoveling (as you well know) is a serious strain on the body. In fact, cold, tight muscles are more susceptible to injury than warmed-up muscles. To warm up and get the blood circulating, take a short walk or perform any kind of full-body movement. Also, do some gentle stretching to loosen up the hamstrings and muscles in the low back. An ergonomic snow shovel is an ideal way to keep some of the strain of that heavy snow at bay. Choose a shovel that has a curved or adjustable handle and is made of a lightweight material. By using this type of shovel, the amount of bending you do and the weight of the snow you’re shoveling can be kept to a minimum. Shoveling smaller amounts over a longer period of time drastically reduces the amount of strain shoveling has on the body. If possible, remove the snow over the course of a few days rather than plowing through it in a few hours. Additionally, if the snow is deep, remove a few inches off of the top at a time instead of attempting the full depth at once. It is also recommended that you take a 10- to 15-minute break when you start to feel worn down. Snow and ice can make shoveling a slippery hazard, resulting in a fall. Wear shoes or boots with good tread and spread sand, rock salt or kitty litter to increase traction and reduce the risk of slipping. Easier said than done. However, using a snow blower can significantly reduce strain on the back (as long as you use your leg muscles to push). By keeping these handy tips in mind, you can steer clear of pain and strain during cold, snowy months. Spine surgery is an ancient craft dating back at least 5,000 years. Its history begins with the Egyptian mummies and includes Hippocrates, often referred to as the “father of spine surgery.” In this long chronicle of spine surgery, the last few decades have seen extensive developments. The advent of tools for microscopic and endoscopic procedures have made minimally invasive surgery not only possible but remarkably effective with greatly improved surgical results, shorter hospital stays, reduced costs and fewer complications. Traditional spinal surgery is typically done through a midline open incision that spans the spinal levels that require treatment. It requires stripping of the paraspinal musculature for access to the bony anatomy and neural structures. Multilevel procedures require a longer incision and more soft tissue stripping because the spinal levels are stacked on top of each other. Unlike other parts of the body that lend themselves more readily for treatment with small instruments and cameras (the knee or shoulder, for example), the spinal architecture does not typically allow for this kind of approach. As spinal surgeons, we are guided by the patient’s symptoms and imaging studies and plan for delicate and precise work in the anatomical areas that require our attention. Minimally invasive spinal techniques have been made possible by technological advances made since the early 1990s. Advances in fluoroscopy (real-time X-rays) have greatly aided in the progress of the field. Smaller and better retractor systems allow the surgeon to use smaller incisions, as well as less stripping and pulling of the musculature for access to the spine. When instrumentation is required, newer implants have smaller footprints and are more friendly to the bony anatomy of the spine. In turn, these techniques translate into less bleeding and shorter hospital stays. The general goal of minimally invasive spine surgery is to stabilize the vertebral bones and spinal joints, and/or relieve pressure which has resulted in pain and potential damage to the spinal nerves. 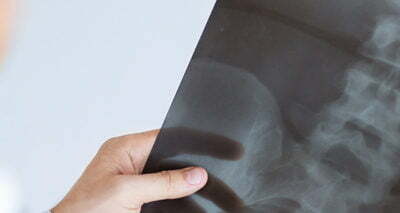 Minimally invasive spine surgery is often applicable in conditions, such as degenerated or herniated discs, spinal instability, bone spurs, spine fractures and spinal stenosis. What percent of your practice involves minimally invasive surgery? How long have you been doing minimally invasive surgery? How many minimally invasive surgery procedures have you performed in the last six months? What training have you had in minimally invasive surgery? Do you present your work on minimally invasive surgery in any scientific context (i.e., journal articles or meetings)? At Northeast Orthopedics and Sports Medicine (NEOSM), we are prepared to address these and any other questions or concerns you may have. It is part of our mission to educate consumers as fully as possible. Contact us at any one of our 10 locations with inquiries regarding any and all spine issues. *Nationally recognized board certification entities are listed with the American Board of Medical Specialties (www.abms.org). The ABOS and ABNS are currently the only recognized boards for spinal surgery. However, that complexity and versatility can come at a price. Because of its elaborate makeup and the important part it plays in bearing the weight of the body, it is also delicate and prone to injury. In fact, back pain is the most common pain experienced, with four out of five adults enduring some type of back pain during their lifetime. How do you ensure that you are the one out of five? Avoid smoking. The nicotine in tobacco products restricts blood flow to the spinal discs, potentially damaging the discs over time. Maintain good sleeping habits. Sleeping on your back or stomach places undue stress on the back. Sleep on your side—ideally with a pillow between your knees—to reduce the risk of added pressure. Keep moving. 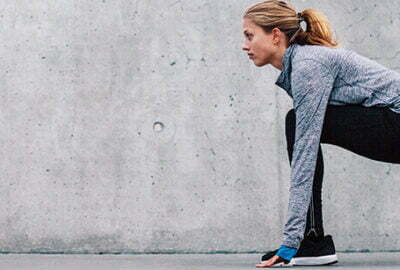 Whether you’re at work or home, motion keeps the body and spine in shape. If you’re at work, get up and walk around approximately every hour to stretch the muscles and promotes blood flow. In your free time, stay active with a visit to the gym or by playing a favorite sport. Lift objects properly. Improper lifting can result in a strain, sprain or worse. To lift an object from the floor safely, make sure the object is as close to your body as possible to maintain a level center of gravity. Then, when picking up the object, use your legs to lift. (Do not bend at the waist.) Finally, keep your back straight when holding the object. When it comes time to transport the object, make sure you have a clear path to your destination in order to avoid tripping. Please note that using your best judgment when lifting a heavy object is key. If the item is too heavy, do not attempt to lift it yourself. Ask for help. Maintain a healthy weight. Keeping within 10 pounds of your ideal body weight keeps additional weight and strain off of your back. Sit the right way. When sitting for a prolonged period of time—such as at work—keep your knees and hips level with one another and your feet flat on the floor. This avoids the weight of your body shifting, straining one part of the spine over the other. Stay hydrated. Keeping hydrated helps to maintain soft tissues, causes fluidity in joints and keeps spinal discs from shrinking. For more information on ways to keep your spine smiling or to schedule an appointment with one of our specialists, contact Northeast Orthopedics and Sports Medicine today.